In general, an exquisite design is believed to have made concessions in functions. However, in the bottom of the heart, people usually show their preferences to products with both exquisite design and powerful functions. The contradiction makes it more difficult to make a choice between portability and capability of the products. Vaporesso Revenger Mini save us out of the choice dilemma. The concentrated body of Revenger Mini has mixed together all the essential functions. As it is suggested in the name, Revenger Mini is the smallest among the three members in the Revenger family. The size of Revenger X mod is 45mm* 89mm, and the size of Revenger Mini is 40mm* 75mm. Obviously, compared with Revenger X, Revenger Mini enjoys great competitive advantage in size, thus it is more portable and convenient to carry as it can be put in your pocket easily. Despite of its exquisite design, Revenger Mini didn't make any concessions in its functions, instead, it has more functions than the other two models in Revenger family. Compared with Revenger and Revenger X, Revenger Mini has applied an IML screen with unique lighting patterns, thus it has made the full use of the back of IML case and has made it more attractive. 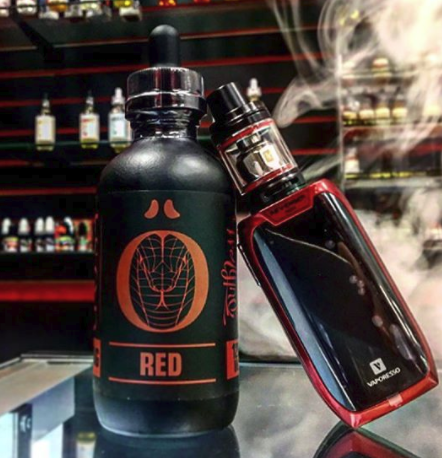 As for the tank, Revenger Mini has inherited the convenient twist open side fill design, and it is more concentrated in the bottom base of the tank, and at the same time it doesn't give way to the smooth air flow system. Powered by 2500mah built-in battery, Revenger Mini also has a maximum output wattage of 85w, and there is several different vaping modes for options to provide different vaping experience.